You've heard all the great things about RGBAW 5-in-1 LED's. 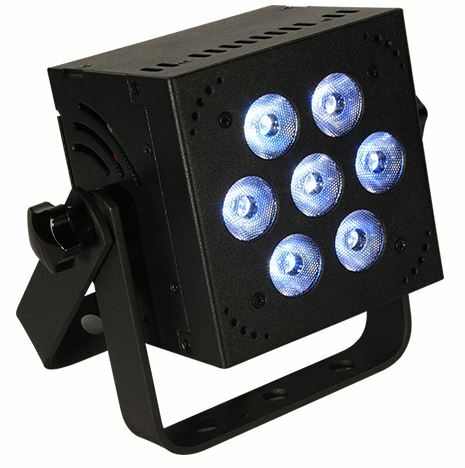 But say you're mixing with all the colors in your 5-in-1 LED par cans, and you want to easily achieve just a bit of more of an eerie hue, or maybe your situation would look incredibly cool with a sudden shot of full on ultraviolet light, alternating with a few brilliant blasts of cool white strobe? Can you get that with your fixtures? Sorry, no you can't! You need the unique abilities of 6-in-1 RGBAW+UV LED's! With this new version of the HotBox™, you'll get the advantage of 7x 15-watt RGBAW+UV 6-in-1 LEDs, advanced electronics, a rugged cast aluminum housing, and the flexibility of secure mounting with dual hanging brackets... it's sure to be a BIG hit in your lighting rig! The HotBox™ EXA features 3/6/8/10 or 11 DMX channel modes, which means it works great with any type of controller, including popular 3-channel controllers. You’ll have full control of all that it has to offer such as RGBAW+UV color mixing, 35 built-in programs, ultra smooth flicker-free 32-bit dimming (5 user-selectable dimming curves), and even easy HSV color mixing ability in 3-channel mode. It also comes equipped with industry standard powerCON® compatible power input/output connections & 3-pin DMX connections which are all strategically placed on the back of the unit in a way that allows you to use the HotBox™ EXA in ANY position, including flat on the floor. This makes the HotBox™ EXA a perfect solution for any of your uplighting and/or truss warming needs!